Attending the Somali terrorism trial before Judge Michael Davis in Minneapolis was an incredibly rich experience. I am still trying to process what I saw at the trial. Like the Orlando massacre, the case lies at the intersection of Islam, immigration and terrorism. The group of Somali Minnesotans charged in the case or gone to ISIS in Syria without being charged numbers 12 or 13 or 14. It’s not a small number, and it only represents the Twin Cities’ angle on the problem. From the time that I first started following pretrial proceedings in the case, I was struck by the Muhammads involved in the case. They seemed to represent a variation of the town hall meeting in Blazing Saddles featuring one speaker after another named Johnson — Gabby Johnson, Howard Johnson, Samuel Johnson and so on. Their appearance inverted the Marxist adage. Here history repeated itself, but first as farce, then as tragedy. The first Muhammad is of course the prophet of Islam. Charles Lister was the prosecution’s expert witness at trial. Lister is the author, most recently, of The Syrian Jihad: Al-Qaeda, the Islamic State and the Evolution of an Insurgency. At trial Lister gave an account of the mess in Syria and the evolution of ISIS. In his testimony he referred without fail to “the prophet Muhammad.” Prophet or not, he is the man without whom…well, you know what I mean. The second Muhammad is Mohamed Farah (photo at right). Farah was one of the three defendants at trial. Like his friends who have pleaded guilty or who were convicted along with him, Farah’s recruitment to ISIS didn’t take much. Growing up Muslim in the Twin Cities’ large Somali community, he attended local mosques and supplemented his education with Islamic studies. Adding a large dose of ISIS videos to the mix was apparently enough to move Farah et al. to aspire to live under the caliphate declared by ISIS. He yearned to wage jihad with ISIS and to die as a martyr. 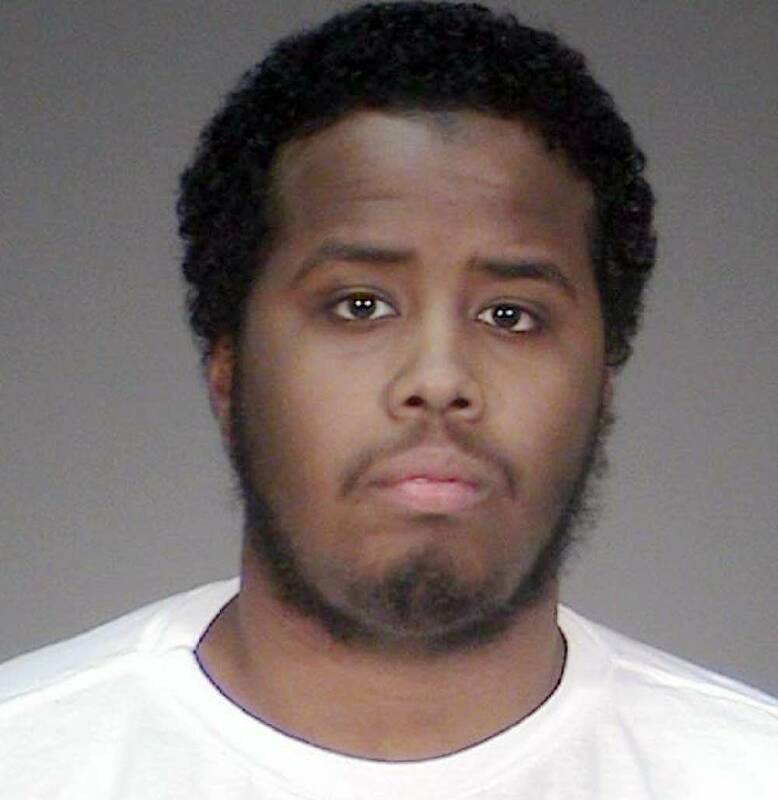 In November 2014 Farah left Minneapolis by bus for JFK International Airport to catch a flight that would get him to ISIS. At JFK Farah was intercepted by the FBI. Asked where he was headed, Farah said he was taking a solo vacation to sunny Sofia, Bulgaria. The FBI sent him back home to Minneapolis. He was ultimately arrested in San Diego the following April in the sting conducted by the FBI. The third Muhammad represented Farah at trial. Murad Mohammad was Farah’s attorney. On the first day of trial Farah sought to replace Mohammad with another attorney. Farah was unhappy that Mohammad had advised him to plead guilty to the charges. Farah told Judge Davis that Mohammad warned him, “Judge Davis will ‘f’ you if you don’t plead guilty.” After interrogating both Farah and Mohammad, Judge Davis denied Farah’s motion. We won’t have an opportunity to evaluate Mohammad’s advice until Judge Davis sentences Farah. As a result of the hearing, we learned that Mohamud had sought to persuade Abdirizak Warsame against pleading guilty. In connection with the hearing Warsame attorney Jon Hopeman filed an affidavit setting forth Mohamud’s efforts to interfere with the deal Hopeman had worked out on behalf of Warsame. On the evening before Warsame was to plead guilty, Mohamud counseled Warsame “that all the defendants should stick together and go to trial, and if they did, good things would happen.” Hopeman, it should be noted, is a prominent and respected member of Minnesota’s defense bar. In his remarks to Judge Davis, Murad Mohammad told Judge Davis that he had emphatically warned Hassan Mohamud not to speak to defendants other than Farah. It was among the first points that Mohammad made. 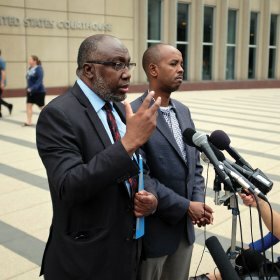 Before his disgrace in this case, Mohamud would frequently turn up in the news as a Somali “community leader.” In the photo at right he is holding forth outside the federal courthouse in Minneapolis in his accustomed style. That’s some “community leader” you’ve got there. As a “community leader,” Mohamud had been invited to participate in the annual tour of secure areas at the Minneapolis-St. Paul International Airpot given by DHS to local Muslim leaders. As Jack Paar used to say, I kid you not. Mohamud took part in such a tour in 2015 but was disinvited before this year’s tour took place. The Star Tribune reported that the disinvitation discouraged Mohamud “because, he said, his mosque has sponsored several events bringing together Homeland Security and the Muslim community.” Mohamud asserted his disinvitation derived from his criticism “of U.S. anti-terror tactics in Minnesota.” On the contrary, however, it’s probably what got him invited in the first place. The fifth Muhammad turned up late in the trial. His name is Burhan Mohumed (photo at right). 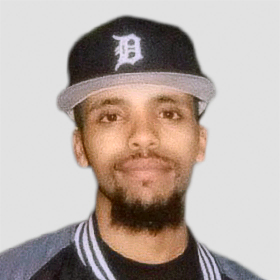 Mohumed is a Somali “community organizer” and friend of defendants. He faithfully attended the trial to support his friends. Mohumed was removed by marshals three times for violation of the protocol prohibiting cell phone use in the courtroom. He was brought before Judge Davis when he got involved in the fight that broke out in the hallway outside the courtroom one morning and refused to let the marshals take his photograph, as Judge Davis’s protocol also required. Mohumed said he had interceded in the fight, trying to break it up. After interrogating Mohumed in open court, Judge Davis banned him from the courthouse for the duration of the trial. I noted these events that morning from the courtroom in part 16 of my trial reports. That wasn’t the last we saw of Mohumed. He turned up in the two New York Times stories on the trial. The Times found Mohumed to be a go-to guy to opine on the purported insufficiency of the evidence to support the guilty verdicts returned by the jury against defendants.